The above is something I wrote a while back in a random note book and recently it's fit very well with the goings on in my life as I make some changes as well as looking back and realising how much I have changed. 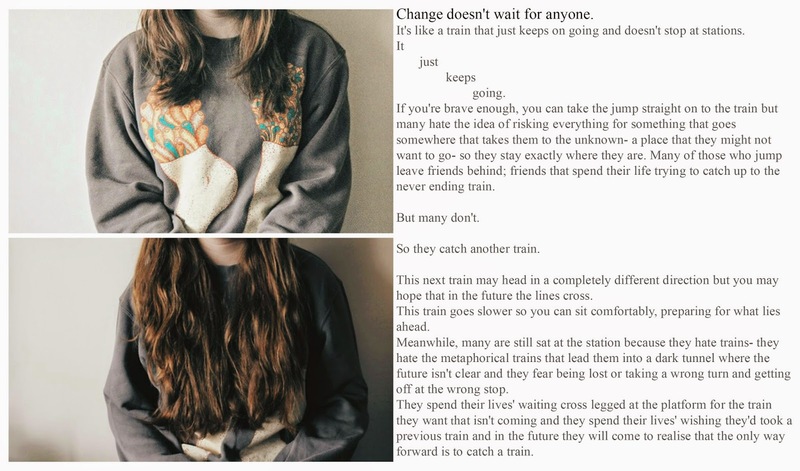 The writing goes a long with two pictures that I posted on Instagram as well as Tumblr accompanied by some more words so if you'd like to read that, it's linked here. Change is something many fear including myself; maybe that's for good reason but a the same time maybe not. Change is something we have to learn to accept and the quicker we learn that, the quicker we can move forward. Change isn't always what we want because the changes we make may have consequences such as losing something or someone or it doesn't give you what you want but you have to risk the change because a lot of the time it's inevitable and there's no way of preventing it. Yes, you can put it off but sooner or later it will catch up to you and you will have to accept the change. Change is such a vague topic that it's hard to get to grips with it all but all I can say is to embrace change because change is good and change is the only way you're going to move forward with your life. For you to get out of life everything you want you are going to have to make sacrifices and things are going to have to change and while it might seem scary at the time and things might even start to go wrong, in the end everything will work out and everything will be fine. 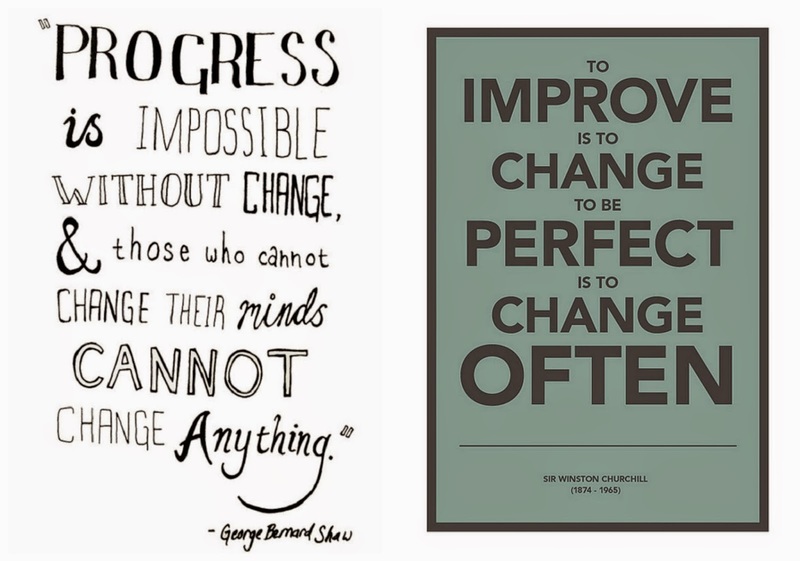 These two quotes above are two quotes I love and they really reflect the meaning of this post which is you can't live your life to its full without admitting to yourself that you'll have to welcome change in your life because changing will happen. Life is full of change and change is not a hindrance in your life but a helping hand to get you to where you want to be. This was a little but of an accidental ramble but it's something that I've wanted to write for a while and while it may not may a lot of sense to you, it's something I wanted to write for myself and maybe you might get something out of it to! Is change something you're scared of?